THIRTY years ago today the fans of Spartak Moscow were struck by a terrible tragedy when at least 66 of them died although the actual death toll could be in the hundreds. It eerily mirrors the 1971 Ibrox Disaster with the same official death toll and a stairway location at the end of a game with a last-minute goal as Rangers fans headed homewards. There are also uncanny connections to the 1989 Hillsborough Disaster with police standing by, like disinterested observers, as dozens died before their eyes from crush injuries and suffocation and medical staff were denied access. And just like the Liverpool victims the Spartak supporters and their families also suffered an extensive cover-up, denial of the facts and denigration of their loved ones who were blamed for their own deaths, accused of being drunk and antagonising the police by throwing snowballs at them. We all know how long and hard the people of Liverpool have fought, against what often seemed like insurmountable odds, for justice, punishment of the guilty and the restoration of the good name of the 96. Now that the Liverpool Campaign is finally entering the home straight we should take a moment to think about the Spartak victims whose death was buried by a Soviet bureaucracy that staged a trial which let the guilty walk free. Unlike Hillsborough the secrets of that terrible Moscow night have been hidden to this day and will never be fully revealed. Before looking at the actual tragedy it’s worth understanding a little about Russian society and the place that Spartak FC held within it. Unlike most Russian football teams Spartak wasn’t affiliated with a branch of the military or a giant State-owned industry but traced its roots to the trade union movement and a working class area of Moscow. As such, it was the most popular club in Russia and its supporters not only delighted in beating CSKA Moscow (The Red Army Team) and Moscow Dinamo (KGB Secret Police Team) but saw it as a victory against a repressive regime which ruled their every moment except during a football game. 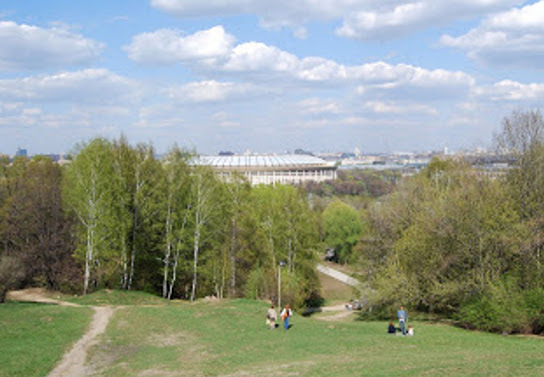 It had its downside however with Muscovites swearing blind that all Spartak’s best players ended-up being conscripted. It’s hard for any outsider to understand, let alone explain, how oppressed was the lot of the Russian people with an ever-watchful State searching for any sign of dissent or even being ‘different’ as the Old Regime began to falter. I remember an Intourist minder warning me to stop smiling when outdoors or on the tram and was told: ‘They will want to know why you are happy. Maybe you have something you shouldn’t have. Better to not draw attention. Russians have nothing to smile about’. I asked if the ‘They’ were ordinary Russians and she smiled and said: ‘No, they would just think you must be crazy person’. So ordinary Russians only let their guard down in family groups and tight friendship circles – other Russians were shunned for fear they might be KGB informers and paranoia levels were off-the-scale about drawing the attention of the State which totally controlled: Housing, heating, employment & promotion, food supplies, medical care, child care, education, the media, city of residence and religion – with Russian Orthodoxy replaced by the Communist Creed. And, never too far away, the spectre of the Gulag loomed for those who didn’t conform or were careless in conversation. One of the few places where a little freedom still flickered was a football game where State Control slipped and the masses could unite and when a military-sponsored team was beaten it wasn’t just a victory on the park as every spectator and the ‘Watchers’ knew the crowd roars and rejoicing were aimed at the State Apparatus. Spartak as the ‘people’s team’ were especially suspect and its management paid a heavy price at the hands of the ruling Stalinist elite. The club was founded and led for seven decades by the four Starostin brothers especially Nikolai and Andrei. All were brilliant players but Spartak’s too frequent successes against military and state-sponsored teams led to them all being arrested in 1942 with 12 years incarceration in the gulag. It was a timely reminder to all Russians, at a time of extreme national peril, that their only value was in defending ‘The Motherland’ and not in supporting a renegade team with supposed bourgeois leanings. Ordinary Russians kept their head-down stunned into impotence that such well-known figures as the Starostins could be treated this way. Nikolai was regarded as particularly dangerous by Beria, the Georgian secret police chief, because in the early 1930s he not only proposed setting-up ‘independent’ sports societies but that they be run by members and not the local Communist Party committee. It may also have been a factor that Beria was the honorary president of Moscow Dinamo, Spartak’s main rival even today, but possibly more important was that he played for Georgia against a team led by Nikolai Starostin and lost. Hundreds of sportsmen began to be arrested and at first no one could put their finger on the reason and then it was realised that they had either played abroad or against foreign teams at home. Despite most of these foreign works teams solely comprising card-carrying communists, Beria believed they were out to subvert Russians and recruit them as spies. At least one referee was executed and others imprisoned especially if any decision was awarded against Dinamo teams and any match they lost was ordered replayed. They came for Nikolai in the middle of the night in March 1942 and he was thrown into Moscow’s notorious Lubyanka Prison. After two years interrogations where he and his brothers were accused of plotting to assassinate Stalin, the elder Starostin was eventually found guilty or publicly praising ‘bourgeois’ sport and sent to the Gulag with his brothers for 10 years although they were always kept in different camps. 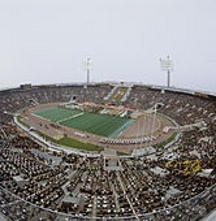 The Central Lenin Stadium was built as the main venue for the Moscow Olympics in 1980 and Spartak, who didn’t have its own ground, played matches there. So, on 20 October 1982 the club faced Dutch-side HFC Haarlem in a UEFA Cup 2nd round tie. On the night of the game the thermometer plummeted and only some 10-15,000 Spartak fans braved the weather to support their team along with a 100 travelling Dutch supporters. Because of the low attendance and snow-bound terraces only the East Stand was opened with one exit. Finally, in injury time, the home side scored a goal and the Spartak fans started streaming out to get to the Metro (subway) but another late goal caused some fans to turn back and the two streams collided with tragic results. There is no need to describe the carnage which followed as dozens of fans died and some heroically tried to save their comrades whilst the Militsia (Police) stood by and did nothing for the trapped, injured and dying and actively prevented other fans going to their aid. The Dutch supporters and even players knew nothing of the tragedy nor indeed thousands of Spartak supporters hustled out of side exits. The cover-up had already begun because the Soviet State did not allow ‘Bad News’ which they perceived to be associated with weakness, especially in difficult times for the Politburo, and times were fraught as President Brezhnev was on his death-bed. Here in Scotland we would immediately scorn the uselessness of the MSM in not mentioning the hundreds of deaths. But we would be wrong as the real story was told but not one an outsider would understand no matter how good their Russian was. You have to remember the family groups and circles of friends I mentioned earlier – 24 hours after the ill-fated game tens of thousands of Muscovites would have been aware of the seriousness of the tragedy through their grapevine. The newspaper reported the official line: Nothing much happened – no deaths just a few injuries – nothing to do with the match – move along. But every Muscovite read between the lines, recognised the silent warning and knew if they spoke publicly about the disaster, especially to a Westerner, then they would face ‘consequences’. These were seldom spelt out as the unknown threat was much more effective in gnawing at the resolve of even the brave. The bodies of the 66 dead weren’t returned home until 13 days after the tragedy. Family, friends and fellow-supporters were prevented from visiting the stadium to lay wreaths and a trial in February 1983 scapegoated the stadium chief of just over two months who confessed to ‘guilty feelings’. But eye-witness testimony about Militsia failures was ignored and no investigation was ordered. It was years before the trial was even reported and seven years before the story of the disaster was broken by Sovetsky Sport in 1989 which only became possible because Communism and its control of the State was imploding. In true Russian-fashion, just to be safe, the story ran just three days after the Hillsborough Disaster in a list of historical football disasters and again, just to be safe, the published death toll of 100 kept it nearer the middle and away from the top-end of the scale. But for the first time ordinary Russians ‘knew’ the scale of the disaster. 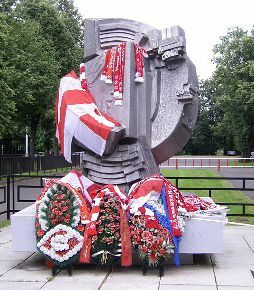 It also meant Spartak fans could start planning a public memorial to their dead paid for out of their own pocket and it was erected in 1992. Even then, the move was only achieved by subterfuge, despite Communism being in free-fall, with the fans saying it would just be a plaque with the names of the dead inscribed. Perhaps this act of defiance showed just what ‘survivors’ the Russian people have continuously proved to be in the many adversities they have faced. But with ex-KGB officer Vladimir Putin holding the reins of power as President of Russia there will be no justice for the Spartak dead or their families. 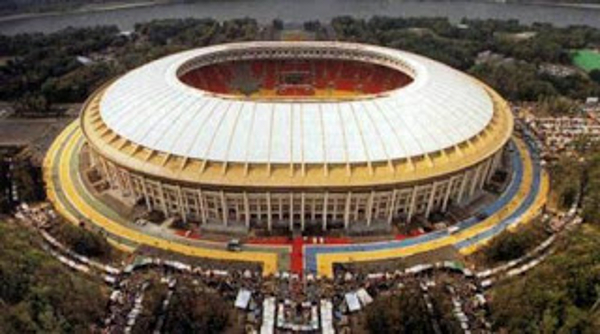 And http://en.wikipedia.org/wiki/Luzhniki_disaster is what I believe to be a magnificent example of the dead-hand of the Russian Bureaucracy showing that Communism might have gone but State Control lives on and is still capable of practising nifty sleight-of-hand. It is well-worth reading the entry especially from ‘Media Coverage’ onwards. I am confident that the readers of this blog will see the ‘massaging’ of facts and have a good laugh at the reference to Izvestia – the paper of record – especially when it states the files on the enquiry had always been publicly available. That is almost certainly fact. But it fails to explain that the power of the State was absolute because Russians ‘policed’ themselves. They knew they could request access to the files and, indeed, would be allowed to see them. They would then disappear to a Gulag where they had no name and just a number and if they revealed their name or ‘crime’ to anyone they would quickly die of natural causes. It’s in Russian but Google translator makes a good fist of turning it into English and the eye-witnesses accounts are well worth the effort. The top-left link under the page heading takes you into the rest of the site. Particularly haunting are the photos of the dead – mainly adolescent boys with some girls and some adults. They will never have justice in the way that Hillsborough Victims hopefully will have soon and it reinforces the need to remember the Spartak fallen. It’s also worth remembering the un-named Militsia Major mentioned on the fan site who repeatedly plunged into the mass of bodies to pull-out victims while his soldiers stood idly by. He is almost certainly police chief Major Koryagin (see Wikipedia article) who was badly injured trying to rescue fans and was to stand trial but given an amnesty. On the 25th anniversary of the disaster, the former players of Spartak Moscow and HFC Haarlem played a memorial match at the ill-fated stadium with money raised for the victims’ families. Martin Haar, the Haarlem captain in 1982, told of the guilt because they had never known about the disaster. I hope all Scottish Football fans will spend a few moments today thinking about passionate football fans throughout the world who one fateful day never returned home to their loved ones but now follow their team forever. And if you ever find yourself in Moscow then head to the Luzhniki Olympic stadium and lay some red carnations at the Spartak Fan’s Memorial. Thanks for another great read ecojon. Keep on keeping on. Excellent but sad read,of a football disaster, that like many Russians,and the rest of Europe and indeed the world had never heard of. Thanks to your Excellent Story, Spartak has now become one of my OTHER teams! A very good article which puts events here (tax dodging and liquidation) in proper perspective. Makes me realise and appreciate how lucky I am. An evocative reminder. Thank you Ecojon. Yes excellent & poignant read. Was aware of disaster & cover up but lot of detail there will make a point of reading links as well. Mibbees a wee banner from our friends the Green Brigade at the CL game on 5 Dec would be appropriate or even from Club itself. Nutin to do wit any ting!!! well done my celtic Welsh bros hope yo make it the World cup !!!!!!!! Still wit the Welsh miners rock on boyos!!! thanks Ecojon excellent post. Mind I didn’t think I’d be greeting on a Saturday night. A poignant reminder of how truth and justice can be perverted by the few to the detriment of the many. It happens time and time again. What has happened to our society when our sense of natural justice has disappeared under the banal tripe drip fed to us from the papers and especially the television? I literally rage every time I hear of a Pakistani or Afghani family murdered by a “drone”, remote controlled by some 19 year old pimpled youth who believes the destruction is nothing more than the plot of some new PS3 game. And our media call the dead “insurgents” or “militants”. How in the name of God, can we accept the policies of “austerity” which ruin lives and communities when we all know we bailed the banks out? With tax payers money. With tax payers pensions. With our jobs. With our children’s futures. All the telly talking heads will tell us is that it is too complicated for us to figure out, so just shut up with the moaning. We have literally been hypnotised and dumbed down and question our own morals and sensibilities. Which reminds me of a certain football team and how our media and institutions covered up and continue to cover up, not only the footballing ramifications of which there are many, but also the dirty secrets which we all know exist in Scottish society, politics and business. I for one, am proud to be a militant insurgent internet bampot. A MIIB 🙂 (not quite Men in Black). I applaud Steveo for suggesting a banner in memory of the 66. And not just a wee banner! It is really a wonderful idea. I hope that that idea goes viral in the Celtic family!! Many thanks to Ecojon for telling us this story. Well done. Unaccountable power corrupts, and obsequiousness, coupled with ignorance, maintains the status quo. Lennon (John) was right: power to the people. The sense of of decency and fairness on this site, and many others, is refreshing and provides seeds of hope. Bastards hate questions; even more so the answers. I have posted to the Scottish Football Monitor that Steveo’s idea should not only go viral amongst the Celtic family but should also be officially recognised by CFC with a minutes silence. If anyone agrees, then, let’s make it happen! Very interesting article. With regard to the Dynamo – Spartak rivalry, and Beria’s involvement, it is difficult to see why Beria did not use his power. and the fear he induced, to guarantee Dynamo success. Spartak won the League in ’38, ’39, ’52 and ’53. In the DDR, Erich Mielke used his power to make Dynamo Berlin (again the secret police connection), all powerful. They did not even need to rely on EBTs. I think it’s quite simple as in ’38 and ’39 Russia knew it would be in a battle for survival at some point in the near future with Germany and I would think that the secret police would have been up to their absolute eyeballs with little time for even a bitter personal feud involving. ’52 and ’53 is also quite simple because Nikolai Starostin was released from the gulag in 1948 on the express orders of Stalin’s son Vasilii who sent his personal plane to Siberia to pick him up as he wanted Nikolai to coach the Russian Airforce Team. 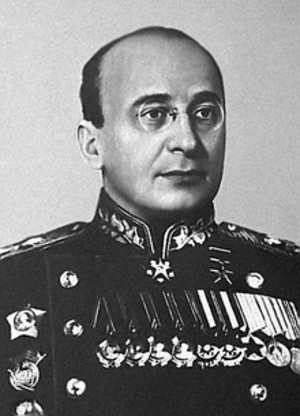 Within 24 hours of Nikolai landing in Moscow, Beria’s goons gave him 24-hours to quit the capital. There then followed a long period of cat & mouse moves between Beria and Stalin’s son and periods of exile above the Arctic Circle successfully coaching. Nikolai got some peace when Stalin died in March 1953 and Beria was executed by the new regime and returned as full time boss of Spartak in 1955. Obviously as Stalin neared his end Beria knew that he too wouldn’t be far behind and again he may have had more on his mind than diddling league placings. There’s tons of stuff about this in the link I provided and is a cracking read. Again, thanks for the additional information. You are suggesting two possible explanations; that the secret police were otherwise preoccupied (pre-war) and that Beria’s political position was weaker than I assumed (post-war.) The fact that Nicholai Starostin was arrested in March 1942, when the Soviet state faced total defeat, suggests that the secret police had priorities which an outsider would consider deranged. The second explanation seems more likely. If Dynamo had a political sponsor, then logically other teams would have a similar sponsor. CSKA, the military; the Soviet Air Force team, Stalin’s son. This would explain the difference with the DDR, where the Stasi had a uniquely powerful role, at least in the later years. I don’t think the linkage between Starostin and Stalin’s son should be underestimated as it originated with a personal connection although obviously moved on into a duel with Beria – which became part of the leadership power struggle and football teams could perhaps be viewed as pawns or weapons in the game. I would tend to accept that most outsiders would reach deranged conclusions when deciding where the power centres lay in the Soviet Union and the interminable struggles between and in the various layers of the State Apparatus which I believe to have been more the ‘norm’ than the concept of a Supreme Dictator in sole total control and making every decision which tended to be the ‘picture’ presented externally..
Only a highly placed Russian IMHO could hope to get anywhere near with an educated and semi-informed guess. Always remember that Starostin was arrested on the charge of plotting to assasinate Stalin and to be fair that bit fits with the whole earlier narrative of promoting bourgeoisie leanings in sport – because of course no matter how many Russians were implicated in the Stalin Plot the actual blame would always fall on foreign secret agents who led natives astray. So was the plot originally manufactured to mobilise the whole Nation behind Stalin or was Beria actually planning to murder him and seize power and just getting his patsies lined-up? Re the DDR I genuinely have little knowledge of the regime and no personal knowledge so I can’t really make any informed comments. I think it worth remembering that we should never view a football team as a self-contained entity. They sat within societies with were based throughout Russia and covered a multitude of sports. They were big organisations with extended networks of power and intelligence and extended the reach, particularly in the military-based ones, beyond a small corps of loyal troops in a localised barracks into a much more dangerous beast spread throughout Russia with communication links that could bypass official channels. As to Beria’s power base and influence there is no doubt that it see-sawed fairly widely in the later years especially as shown in the Mingrelian Affair. I think that the mindset of Boshevik leaders helps explain why secret policemen became so important in the system; it was not just that they did the dirty work of crushing dissent – real or imagined. The Bolsheviks took History seriously and saw the Revolution as being threatened by a potential military coup; this was the lesson of the French Revolution and Napoleon.